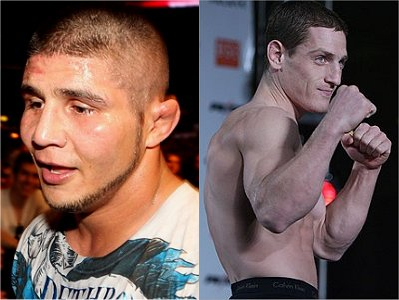 There's a fantastic lightweight match-up brewing between former Ultimate Fighter (TUF) champions Joe Stevenson and Mac Danzig, as the veteran 155'ers are currently in talks to throw down at the upcoming UFC 124. A fantastic lightweight match-up between Joe Stevenson and Mac Danzig is brewing, as both 155-pound fighters are negotiating to lock horns at the upcoming UFC 124. Joe Stevenson is coming from a loss against up-and-coming George Sotiropoulos at UFC 110 last February. Although distinguished by his high-quality grappling skills, Stevenson was dominated by the Australian fighter in every capacity. But prior to that bout, Stevenson has reeled off two consecutive wins over Nate Diaz and Stephen Fisher. His August bout with Takanori Gomi was scraped in the line-up after suffering a knee injury, and was replaced by Tyson Griffin. Mac Danzig, on the other hand, was also forced to withdraw from UFC Fight Night 22 versus Matt Wiman after acquiring a bum pectoral and pinched nerve. But Danzig gets to move on to bigger and better things, now that he’s 1-4 in his last five fights — that is if he can get past Stevenson. The UFC 124 will be headlined by a welterweight match between George St-Pierre and Josh Koscheck. The event will take action on December 11, in Montreal, Quebec in Canada.